Leaders spend too much time crafting values statements and too little putting them into practice. The work isn’t crafting values; it’s living them. The most important new system you could implement is one that enables you to evaluate and align behaviors with values. The sense of accomplishment from crafting a powerful values statement is misplaced. Leaders huddle in isolation debating definitions, grammar, and punctuation. You haven’t done anything until you put your values into practice. The power of values is in the living, not the writing. Tell stories of how values are expressed in daily decisions. Evaluate daily behaviors with values statements. Define how living by values enables your organization to execute strategy and achieve goals. The deeper work of leadership is organizing people around shared values. Values without behaviors are meaningless. What behaviors express our values? We best see our values when we …? How do our values guide us while we execute strategy, achieve goals, and reward results? What are we doing that undermines or conflicts with our values? Who exemplifies our values? What are they doing? How might we honor and emulate those who best exemplify our values? Authentic leaders bring organizational values to life. What system to evaluate and propagate values might leaders institute? Creating system is very important component towards making organisation powerful. And such systems are divided on the basis of leadership philosophy. Many leaders might create a system that encourages subjectivity. Many leaders might create system that strengthen their personal power. There are leaders who create system that empower the organisation. So, creating system has hidden driver. This driver is leadership intention behind creating system. This plays the most crucial role. Now, there might be question, which style is good and why. The answer is simple one. Evaluate the impact of each leadership system. It should be evaluated taking holistic perspective. Whom does such system strengthen. Any system that strengthen organisation is good system. Rest other is not desirable. This is my way of looking at the things. This might lead to various debate and discussion but the fact is that leaders always create leaders, leave legacy even after they have left the system. Leadership is a intentional choice. Thanks Dr. Gupta. It’s great that you decided to focus on systems. Why are we creating a system? How are our systems creating new leaders? I’m glad you stopped in to provide insight in this area. Wow! Spot on analysis and proposed cure! Coming from a career in law enforcement, it is amazing and saddening how many agencies I’ve seen spend great amounts of time crafting lofty mission statements and values statements, but are actually guided by other, often unspoken, values such as maintaining and expanding political power, partisanship, cronyism, nepotism, or just preserving the status quo. I’m sure the business world has parallels. Reversing this situation organization-wide MUST begin and be driven from the top. As someone once said, what is lived in the halls is more important than what’s posted on the walls. Thanks Jim. Your idea that values are driven from the top is important. Including everyone in the process is essential, but these initiatives won’t go anywhere without buy in from top leadership. Your last comment is very true, Dan. The opportunities I had over the years to lead various departments and units with relative autonomy were what kept me going. The experienced realization that values-based leadership could be practiced successfully helped me maintain hope during rough times when my “leaders” (sometimes actually “misleaders”) were real obstacles to excellence rather than facilitators for it. Creating “pockets of character and competence” was sometimes the best I could do. Thanks for pointing out that possibility. Jim – I’m from law enforcement also – and you nailed it for me also. It was more important for us, when directed to create our values statement, to have it posted on the wall than live it in the halls. I’ve found many similar parallels in the business world and I wish LE operated more like the business world. Take care! I have seen some exceptionally well thought out and eloquently writtin Value/Mission Statements throughout my working life. As well, I’ve been tasked in the past to write Mission Statements myself. I must admit, I did receive a ‘sence of accomplishment’ upon approval exectutive staff and the company CEO. However, there’s another effect power and authority can have on the very same people, but with a vastly different ‘Negative’ effect. Power and authority that is bestowed upon those who are ‘not worthy’ can turn ugly quickly. Often a lack of maturity and experience with these leaders often cause them to adopt a ‘Bully Mentality’ and approach to addressing daily responcabilities, unseen problems that arrise. This bully mentality also works very well to ward off those who question your decisions and actions. It takes wisdom, humility, common sence, and the knowledge that it’s (People that make a leader shine), or FAIL. Impressive Vision/Mission Statements.are not worth the paper they were written on when ‘no-one’ follows their direction. Thanks SGT. If I read between the lines of your comment you value authenticity and fairness. I wonder how those values bring satisfaction or frustration in environments that require highly structured relationships? I like to think of it as an environment or ecosystem of values and behaviors. There needs to be room for evolution and adaptation, supported by the alignment meetings and such. Terrific post, Dan. Thanks Steven. I’ve read that our values don’t change. Your comment suggests that they could. I know mine are evolving. Perhaps the core ideas don’t change, but expression might. That right there is gold. I spend most of my days deciphering what upper management is saying. Everything is so abstract, seemingly arbitrary and full of jargon. What they say may make sense at a high level but it needs to be more actionable as it filters down and that first question helps to make sure everyone is on the same page. What you wrote today reminds me of Albert Einstein. Einstein was one of the most intelectual and eloquent speakers of his time. Einstein was capable of communicating at an extremley high level he was commfortable speaking with the worlds greatest minds of his time.. Yet Einstein never flaunted his level of inteligence, or his exquisit communication skills when speaking with the ‘common man’. Thanks Kelly. It’s a pleasure to serve. The crafting of clear values is important, but not nearly as important as the behaviors associated with them. Big deal if you value “excellence.” …the issue is, what behaviors express your value of excellence. “WOW DAN!” In just a few short sentences you said a ‘mouthful’. And sadly, ain’t it the truth. Love the image and words today Dan. Thank you. Thank you for the great post! With employee engagement hovering around 30% in the U.S., there is no doubt we need more leadership that walks their values talk. Most companies state that their employees are their most valuable resource and yet so little time and effort is focused on things like evidence-based team training, building a culture that promotes health and wellbeing, understanding cultures within the culture, or connecting employees to purpose. Any company that is seeing a high rate of turnover needs to take a hard look at whether or not their values are just words on a page. Really Dan thanks a lot for such a wonderful post and behavioural analysis on personal values and organisational behavioural analysis with values of organisation is very important, fabulous post. This is my request through some light on behavioral psychological stress on success ratio and individual growth along with team building parameters. Thanks Vinay. I’d love your thoughts on those topics. BAM! This one really hit home and took me back in time to our “mandatory” directive to create values statements where more time was spent on the wording but not the implementation nor buy-in. It was considered a joke by the vast majority because management really only wanted the final product on paper (to be hanged in the hallway for all “visitors” to see) with little attention to it impact on the workers. I can’t recall if everyone was “required” to sign a copy or not – but if they did, it was only because they were requir d to do so. Great post, Dan. Thanks! One system to propagate values is to talk candidly about the difference about Ideals and Values. Ideals are something we would like to have at a FUTURE point in time. Values are something we want and will make sacrifices to have TODAY. Then you can ask your team what you are willing to do to make your values a reality today. Oh Dan… You hit a home run on this one! Nothing says commitment to excellence like “walking the walk”. However, what we most often find is that the crafted exemplar mission/vision statements simply hang adorned in an elegant frame at the corporate office. Oh sure, there are corporate pamphlets and other organization propaganda containing the same mission statements but to the people of the organization, they are nothing more than mundane words much like the placard that indicates the janitor’s closet. True commitment, value and innovation comes from actually doing what you say you do and that requires effort, investment and dedication. In our “set it and forget it” mindset, we establish things like developing a mission statement, check it off the list and consider it done. It is vital for any organization to say what you do and do what you say you do. Any written values statement should flow from the accumulated body of RESULTS you produce and from what others say you actually do not what you think you do. Dan, powerful insights to making values come alive. Love your ideas. I always say values are who you are — not what you want to become. I now talk about our core values as heart values. 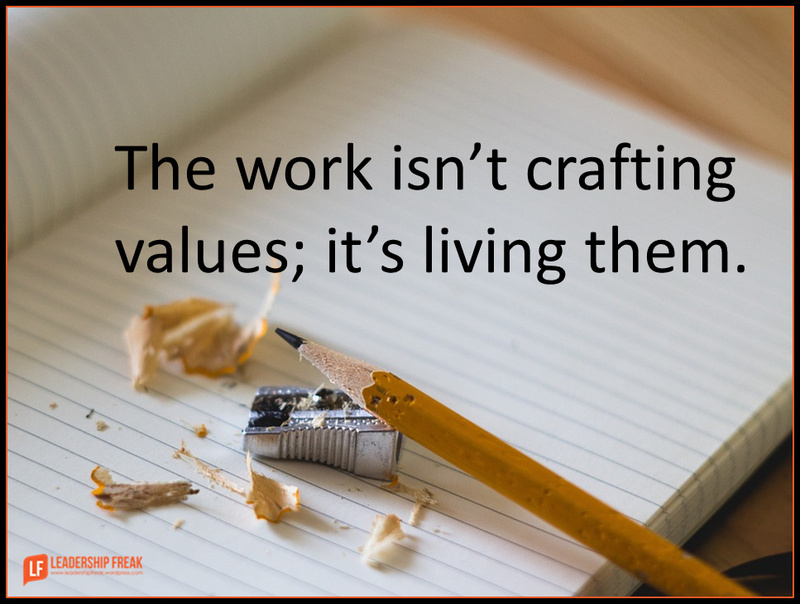 A great post Dan and I could not agree more that living the values is far more important than crafting them. Although the crafting can be a very valuable exercise when it’s performed and owned I a collaborative way and not just done in a darkened room by a few. What is also critical to the success of ensuring that an organisation lives its values is helping individuals understanding what are there true values. Once they understand this they can then start to truly understand, relate and live the organisational values! Thannks or a great post, keep them coming.